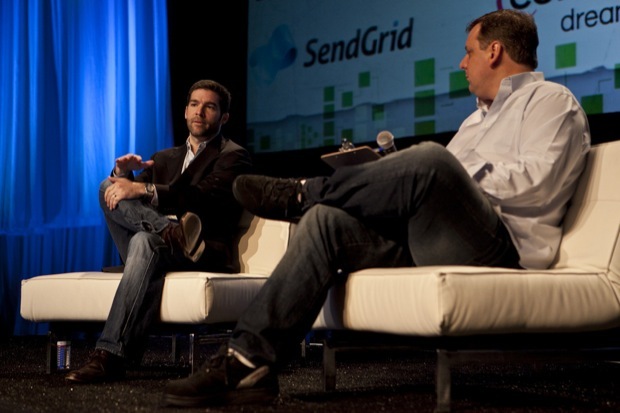 LinkedIn’s CEO Jeff Weiner has just unveiled LinkedIn Signal at TechCrunch Disrupt, a new feature that neatly marries the worlds of LinkedIn and Twitter and allows users to apply the professional social network’s filters to Twitter’s firehose. Think of it as a window into Twitter (and LinkedIn’s updates), through the eyes of LinkedIn. 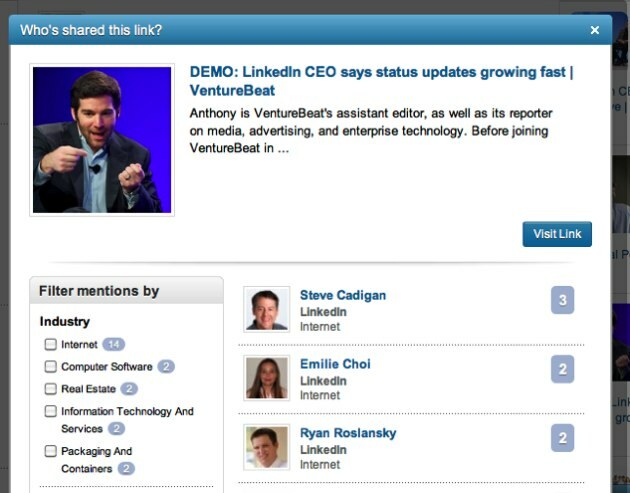 LinkedIn Signal, which is currently in limited beta, allows users to sort through Twitter updates of LinkedIn members (you opt in by syncing your accounts) and the site’s own updates on a very granular level. The feature’s page offers three main panes, on the left side there is a dynamic list of filter options, the mid-section shows the stream of relevant updates and the column on the right shows “trending links” that may be relevant. So far, there are 8 main filters: network, industry, company, the date the update was published, by geography, school and hash tags (all powered by LinkedIn’s structured profile data). Signal guides you through your query by showing the number of results per filter option, which helps users decide whether their filter is too broad or too narrow. The search feature, which can be set as a user’s homepage, lets you save past searches, allowing you to track tailored topics, like comments about your boss. 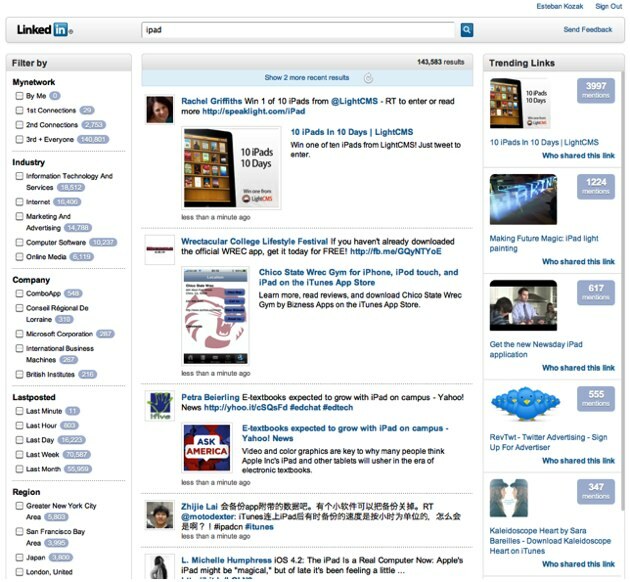 The trending links column is also interesting here because it tries to surface special links and news stories related to your search— as the company points out in its announcement, a search for “TechCrunch” will yield different results than one for “Meg Whitman.” Amusingly, you can also see which LinkedIn users have shared a link (this is sortable by industry, company and region). Just like Twitter’s “trending topics,” the section not only encourages user engagement but it provides a possible monetization opportunity. “Promoted link” anyone? LinkedIn Signal is somewhat limited since it only pulls in its own updates and Twitter’s feed (the company is considering future tie-ins), which of course has to be confined to LinkedIn members, in order for all that data to be sortable and make sense. However, LinkedIn’s size should make search results fairly meaningful— according to the latest stats from LinkedIn there are more than 70 million users and the site’s status updates have grown 10x in the last 12 months. Beyond a curiosity, I could see this becoming an interesting tool for researchers and professionals, especially journalists like myself. For example, if the CEO of a multi-billion dollar technology company was abruptly ousted by his board (not thinking of anyone in particular here), within seconds, I could find out what that company’s employees were saying about the CEO and what links they were pointing to. However, at the heart of this is LinkedIn’s attempt to be more relevant and social in the world of, well, social. Personally, I signed up for my LinkedIn account because I wanted a more professional alternative to Facebook for my work contacts and it’s been an indispensable tool for this reason. However, while I interact with Facebook and Twitter on a daily basis, I don’t feel compelled to visit LinkedIn with any real regularity. That’s the consumer pattern LinkedIn needs to change. As we’ve seen from Signal and from recent product announcements, such as the new social layers wrapped around groups, LinkedIn is certainly driving in that direction, now, will the consumer respond? Intrigued? 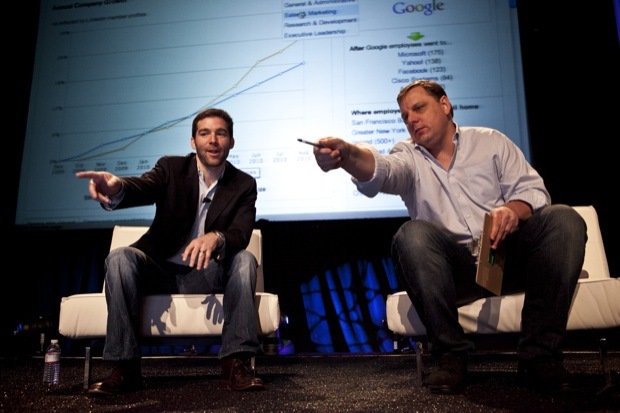 We have exclusive access for 250 TechCrunch readers, click here.